Too Little Time: Hello To All My Friends! I feel like I've been gone an eternity, though I haven't gone anywhere. Between the kids being home (absolutely loved it but we were all ready to return to a schedule) and work being wacky because of the holidays, I feel very disjointed. I would like to take the time to post a nice long update with photos... but I'm suppose to be sleeping as I have to work again tonight. Than Thursday, Friday, and Saturday are packed so it will probably be next week before I have time to say much more. I am hoping that I will catch up with life again here soon (do I say that in every post, sure feels like it). I have been knitting.... just finished a Baby Surprise Jacket which I absolutely love both the finished item and the pattern! 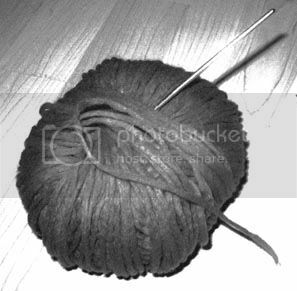 I have been listening to Knit Pics Podcasts (got an IPod for xmas) and want to purchase a bunch of books now. I need to find the time to get a project together (yarn, pattern, needles) so that I can start on something else, but can't find that time either... UGH!!! I'm psyched to hear about your BSJ! Can't wait to see a photo. I just bought the yarn to make a second one--they really are addictive. Take it easy...post when you have a minute to breathe. We can wait. Although, I am looking forward to seeing all your knitting! I got the opinionated knitter by EZ just so I could make a BSJ, and still haven't gotten around to it lol ;) Can't wait to see how yours turned out. I'm still disjointed from the holidays, oh who am I kidding I'm always disjointed LOL ;)!! I figure if I'm blogging less and being with my family more, and maybe even knitting more, then that's a good thing.There are only so many hours in one day, right? Visit my blog, there's something for you!